The most popular report offering for our MBA Lifecycle Survey Suite has been renamed to better reflect the value and enhanced utility of this business school market research tool. 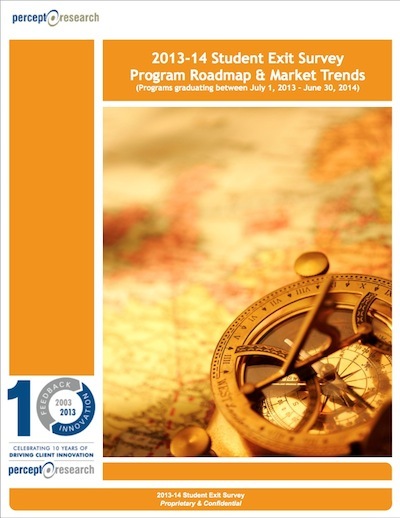 The previous Competitive Intelligence Report (CIR) is now called the Program Roadmap & Market Trends Report (PRMTR). In 2006, we combined what was then called the Standard Report and Peer Report into a single offering called the Competitive Intelligence Report so that participants would receive industry benchmarks with the graphical trending and at a reduced cost. Last year, we implemented a significant functional enhancement to the Competitive Intelligence Report with the integration of Key Driver Analysis to provide more actionable value to MBA program administrators (again, at a further reduced total cost than as separate reports). We wanted to move away from the term ‘Competitive Intelligence’ in the previous name as it seemed to signify that the report focused solely on peer benchmarking. In reality, peer benchmarking is only a component of the analytical power of this offering. More critical to continuous improvement than the peer benchmarking, this report displays internal trends (program ratings) graphically compared to industry segments (such as program size, geographic region, and program type). The Program Roadmap & Market Trends Report also presents a proprietary measure of student/alumni loyalty called the Student Loyalty Index. This index measures the degree to which students feel positively toward their experience and will advocate the program. The Student Loyalty Index is based on three measures that predict the proportion of your students/alumni that are so satisfied that they are likely to remain vocal and loyal supporters as alumni (Champions), as well as those that are so dissatisfied that they are likely to spread negative feelings about the program (Detractors). The integration of Key Driver Analysis into this report creates a ‘roadmap’ for optimally driving continuous improvement. Business schools employ this tool to understand which factors have the greatest impact on student loyalty. This analysis is based on the relationship (i.e., correlation) between each survey measure with the Student Loyalty Index. The Key Driver Analysis is an at-a-glance graphical display of the MBA program’s key drivers of loyalty based on brand ratings and derived (or stated) importance. 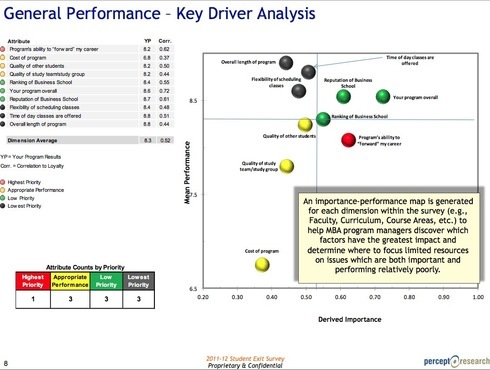 Within the Program Roadmap & Market Trends Report, an importance-performance quadrant map is generated for each dimension within the survey (e.g., Faculty, Curriculum, Course Areas, etc.) to help MBA program managers discover which factors have the greatest impact and determine where to focus limited resources on issues which are both important and performing relatively poorly. These importance-performance maps provide decision guides for translating MBA stakeholder perceptions into strategic allocations of organizational investments. Check out this blog article for more background on this great managerial tool: Leveraging Limited Resources for Biggest Impact – MBA Brand Research. We feel that the name of this report will better reflect our continuous improvement philosophy regarding the value of external benchmarking compared to internal trending as well as the power of Key Driver Analysis. External benchmarking is typically used to justify and validate program delivery, but this is too narrow of a viewpoint in today's dynamic market. While benchmarking provides some productivity metrics, it's anything but a simple exercise, and it by no means tells the whole value proposition for a MBA program. Simply put, both external benchmarking and internal trend analysis paint a complete picture. With internal trend analysis, a program can compare its historical and overall ratings to interpret the latest survey results. External benchmarking can be utilized to determine where their survey ratings lie in comparison with peers to establish a frame of reference. At the same time, Key Driver Analysis highlights those factors that are most urgent for improvement and those that are strategically important. This ‘roadmap’ feature provides the strongest value of the report, which is the reason we positioned it first within the report title. Starting in 2014, all of our MBA Lifecycle Suite surveys will adopt this new report name. The fee to receive this report will remain the same as last year. Percept Research will continue to offer a Topline Summary report option, providing a low-price entry point for new clients and allowing business schools to grow their investment in these assessment tools as their budgetary constraints will allow. The Topline Summary includes results only from the most recent survey (no trending). This summary is not designed to be a stand-alone report, but rather a snapshot of the survey results, which is delivered shortly after the survey has closed for each MBA program (the Program Roadmap & Market Trends Report is generated at the end of the survey fielding year). We anticipate that more programs will opt to receive the Program Roadmap & Market Trends Report with this title change as it better reflects the value of this evidence-based tool. The Program Roadmap & Market Trends Report empowers MBA program leadership with a data-driven assessment of how their MBA program has performed and identifies which factors should be improved for greater impact in program success.